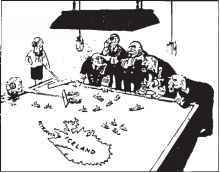 Officially, there were three Anglo-Icelandic Cod Wars (1958, 1971, 1976). In fact, there were four, if one includes the 1952 dispute over extending the fishing jurisdiction from three to four miles. Each of these wars had its own dynamics, its own history, and its own international as well as domestic political and economic settings. In addition, each conflict took on a different degree of importance to the protagonists. In retrospect, the first unilateral extension from three to four miles in 1952 was perhaps the least important to the UK distant-water fishing industry, while the third one, from 12 to 50 miles in 1971, caught them and their government by surprise. Table 12.1 graphically depicts how these linear fishing limit extensions translated into areal expansion of Iceland's fishing grounds and, therefore, gives a better idea of what such extension actually meant with respect to the area of fishing grounds lost to UK vessels (and gained by Icelandic authorities). 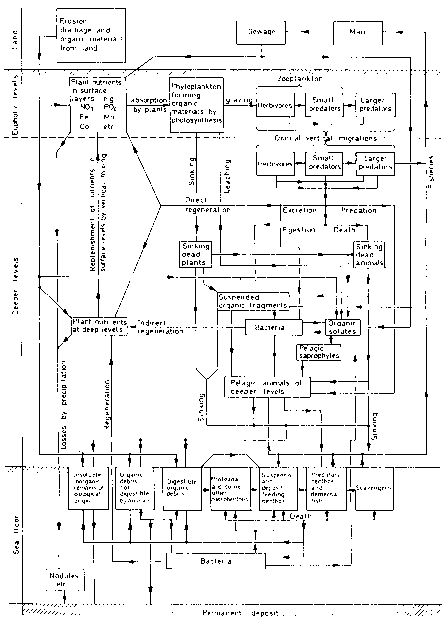 Compiled from information presented in Jónsson, 1982, pp. 3-5. Many publications have appeared about various aspects of these conflicts and the issues that they have raised: the historical development of the Law of the Sea; the role of international scientific, political, and economic organizations in the management of an international conflict between allies; the relationship between national interest and natural resources; the use of uncertain scientific information to resolve resource-related conflicts, and so forth. This chapter clearly cannot do justice to each of these issues. Nevertheless, despite the relative uniqueness of each of these Anglo-Icelandic conflicts, some general themes recur from one conflict to the next. 1. Icelanders (as well as many other observers, including many segments of the UK public) believed that Iceland's national survival was closely tied to the preservation and expoitation of living marine resources that surround their island nation. If anything were to happen to that resource (e.g., an adverse change in availability or abundance), Iceland's existence would be fatally threatened. Thus, the resource had to be (a) protected and (b) made available to Icelanders for their exclusive exploitation. Clearly, the strength of the Icelandic economy improved or deteriorated with the ups and downs of the fishing sector. 3. In each instance, Iceland was able to use the disparity in power and resources between the UK and itself to its advantage. Iceland, with a population of less than a quarter million, with no military establishment except for a few patrol boats, was determined to defend its right to control the exploitation of resources in its coastal waters. The UK used the Royal Navy in a show of force to intimidate Iceland but were unwilling to unleash their full military power against a NATO ally. The disparity in resources between the protagonists aided Iceland, which fostered the image of a David taking on a Goliath. 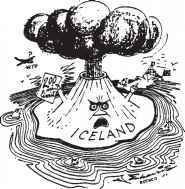 International sympathy generally flowed toward Iceland (see Fig. 12.6). 4. Law of the Sea discussions in the United Nations from the late 1950s onward provided an important backdrop to the Anglo-Icelandic conflicts. Over the centuries Iceland's fishing jurisdiction had changed from 32 miles to 24 miles to four miles (in 1859). As the result of a 50-year agreement signed in 1901 between Denmark (then in control of Iceland) and Great Britain, Danish exports of ham and butter to the UK were to receive favorable tariff arrangements in return for a reduction from four to three miles of Iceland's fishing jurisdiction. This arrangement became a lingering grievance for Icelanders. "D'you know, I haven't hod io much Ion line* Bol'l» of Jutlondl"
"Active volcano!" t. A. Harm, Canada. Fig. 12.6 Upper left: Cartoon by Crockett, Washington Star News, reproduced from US News & World Report, 11 June 1973, p. 33. Upper right: cartoon from Evening Standard, reproduced from Time, 29 December 1975, p. 25. Lower left: cartoon by E.A. Harris, Canada, reproduced from European Community, March 1976, p. 16. Lower right: cartoon by Bac, Nuerenberger Zeitung, reproduced from European Community, March 1976, p. 14. 5. From Icelandic independence (in 1944) onward, successive governments sought to protect the nation's living marine resources. With the passage of a conservation law in 1948, Iceland sought to regain control over its adjacent waters congruent with its isolated continental shelf which it considered a natural extension of its land. Each of the four unilateral extensions was embedded in a mix of already-existing fishing jurisdiction claims made by other coastal nations. For example, in 1948 Peru, Ecuador, and Chile had already claimed 200 miles, at a time when most states claimed only three miles. Ten years later, at the first UN Conference on the Law of the Sea, a vote to extend territorial waters to 12 miles (six miles for territorial jurisdiction and six miles for fishing jurisdiction) failed to pass by one vote. According to Akaha (1985, p. 38), "... following the unsuccessful second UNCLOS [Geneva, 1960], one coastal state after another resorted to unilateral actions to expand their territorial sea and fishery jurisdictional claims." Thus, Icelandic territorial and fishing jurisdiction claims, with the exception, perhaps, of the 1971 extension (from 12 to 50 miles), should not have been viewed as unprecedented (Table 12.2). * Including five states claiming fishery jurisdiction beyond and in addition to the 12-mile territorial sea limit. Source: Kenzo Kawakami, cited in Akaha, 1985, p. 40. By the early 1970s there was a general movement in the international community toward approval of 200-mile EEZs. Despite its opposition to the 200-mile extension by Iceland, the UK was considering the enactment of its own 200-mile jurisdiction in an attempt to protect its inshore fisheries and to improve its bargaining position in negotiations for a common fisheries policy for the European Community. 6. With successive unilateral extensions by Iceland, British Humberside ports, where distant-water trawlers unloaded and processed their cod catches, opposed Iceland, claiming severe injury to their industry and economy (loss of revenue, loss of jobs in the fishery and in ancillary industries, etc.). They initiated multi-year boycotts against the unloading of Icelandic fish in their ports. The initial claims of damage were apparently unfounded in the two earlier disputes, as UK landings actually increased following the exclusion of UK vessels. The increase was due in part to a focus on new fishing grounds in the area as well as improvements in fishing technologies and techniques. Such was not the case with the last two Cod Wars (1972 and 1976). There were no new equally productive fishing grounds for UK vessels to exploit. Only overcrowded fishing grounds, less preferred species, and newer grounds were available beyond the travel range of many of the existing vessels (Fig. 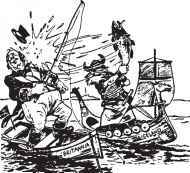 12.7) (British Trawler Federation, 1958; British House of Commons (5th Series) 20 July 1971, pp. 1416-17). Concern was voiced about the future of Humberside ports. British trawler owners raised another aspect of the equity issue, when they noted that the population of the port of Hull was totally dependent on the landing of Icelandic cod and that its population was greater than that of the whole of Iceland. In a 1971 House of Commons debate on the unilateral extension of Icelandic fishing limits, a member of Parliament noted that the 12 to 50 mile extension brought an immediate and angry reaction from the whole industry: from the fishermen and their union ... ; from the trawler owners and the merchants, from Fleetwood, 62.2% of whose total catch in 1970 came from Icelandic waters; from Grimsby with 41-1%; and from Hull, where 25% of last year's catch of demersal fish was caught in Icelandic waters (British House of Commons (5th Series), 20 July 1971, p. 1407). Another speaker also noted that "the exclusion of our vessels [from fishing grounds in the Icelandic area] would deprive us of between 20-25% of all British landings of such species as cod, haddock and plaice ..." (British House of Commons (5th Series), 20 July 1971, p. 1416). Figure 12.8 depicts the declining number of fishermen at major UK distant-water ports.